The Penna in Teverina village of the umbrian country has many similarities with the closest villages of the amerino region. Like for Attigliano, Avigliano e Alviano, several dinasties had the power of the town for all the middle ages and renaissance time. Aimed by both the pope and the town of Amelia , it was finally administrated by the family of the Orsini. 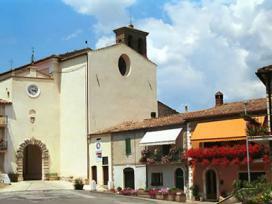 Today Penna in Teverina, is a perfect combination of well preserved monuments and a quiet and paceful environment. The old town still presents its original structure and a beautiful view of the Tevere river and valley. The entrance is through the Porta Civica, which leads to San Valentino Square on which there is the parish curch, once the center of daily life.It is from Porta Novella that the Tevere valley can be best admired. The Orsini Palace is definetly to be visited, on which a nice garden opens. Still visible are the two logos of the two families which owned the castle: the rose of Orsini family and the eel of the Anguillara family.